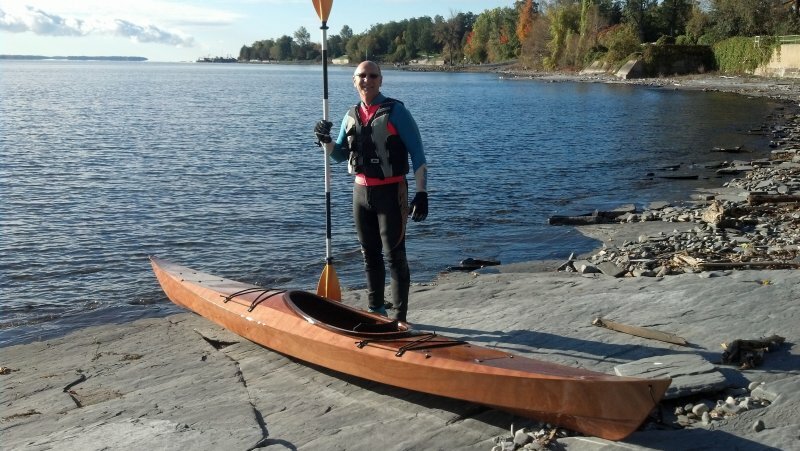 Exactly 2 months from the day I began my kayak building adventure at The WoodenBoat School, I christened and launched my Shearwater Sport on Lake Champlain. What a joy to finally see it in the water! Despite the chilly morning air in northern New York it was a beautiful fall day and my shearwater sport performed admirably, as expected. Named in honor of the love of my life, Jacqueline Skiff, whose last name is serendipitously apt! A special thanks to Eric Schade for his patient and expert instruction, as well as to the entire WoodenBoat School staff. Jackie and I had a wonderful and memorable week at WoodenBoat this past August. We are looking forward to going back soon!